The Library of Congress has created a new photo set to help celebrate Lincoln's 200th birthday later this month. The collection of 22 photos includes the earliest known photo of Lincoln in 1846. Check out the Lincoln photo set on Flickr here. 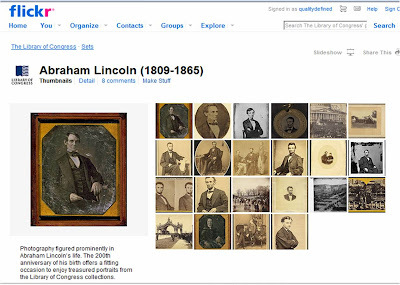 Check out the Library of Congress blog post about the Lincoln photo collection here. Isn't it great that the Library of Congress is using Web 2.0 tools to both tell us about this collection and then posting the images where they are available to teachers and students! Thank you for posting these pics. My special ed class just started their first blog and we are so excited to hear from people all over the world. Please pass this on to others and ask them to stop by www.coconnections.wonecks.net to leave a comment.